❤Are you searching for a natural fresh bag that effectively absorber odors? ✔Well, your quest for the perfect nature fresh is over, now you've found the best gift for your home! ✔This charcoal bag absorbs the bad smells, allergens and harmful pollutant, can reduce nose allergies for odors. ✔This air freshener bag absorbs moisture to prevent bacterial from growing, good for pregnant women. ✔Plus, you get a 100% lifetime replacement warranty. You can hang or place this natural fresh bag anywhere you want to use it. To reactivate, place the natural fresh bag outside in the sun once a month for at least two hours. This charcoal bag is perfect for small areas such as cars, closets, Drawers, refrigerator, bathrooms and laundry rooms and so on. Each 200g charcoal bag will cover up to 9 square meters. When used in bigger spaces you need to use more charcoal bags. To remove stale odors you would also need to use more charcoal bags than usual. Here is the science how this air freshener bag works. The bamboo charcoals inside have large surfaces and pores, that are capable to trap and filter toxins, allergens and pollutants. ✹【THE BEST GIFT FOR HOME】Are you searching for a natural fresh bag that can effectively absorb odors? 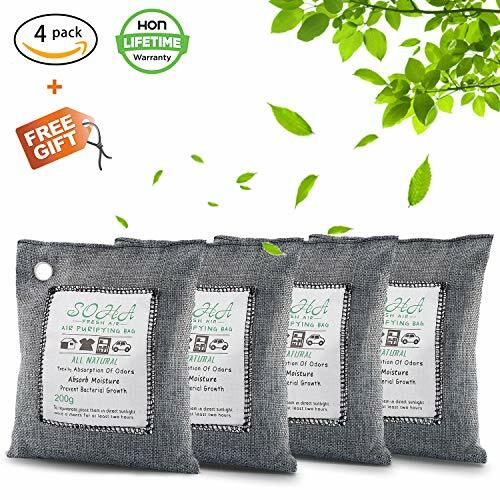 This natural fresh bag makes the air smell fresher by absorbing the bad odors, allergens and harmful pollutant, this natural fresh bag is the best gift for home that you can use it anywhere. ✹【PREVENT MOLD AND BACTERIAL GROWTH】If you are having an issue with mold and bacteria. This nature fresh is definitely the product you want to invest in. This nature fresh prevents mold and bacteria growth by absorbing any excess moisture. This nature fresh helps with moisture, mold and bacteria problems. ✹【EFFECTIVELY REDUCE NOSE ALLERGIES FOR ODORS】Are you looking for a natural way to deodorize any smell which is always stimulate your sensitive nose? This charcoal bag is a ideal odor absorber because of the bamboo charcoals inside have large surfaces and pores, so, this charcoal bag is capable to trap and filter toxins, allergens and pollutants, can effectively reduces nose allergies for odors. ✹【GOOD FOR PREGNANT WOMEN】If you have been pregnant and the smells have been bothering you. This air freshener bag can help you to relieve uncomfortable odors during pregnancy. This air freshener bag is great at absorbing odors. This air freshener bag is free from chemicals, fragrances and toxins, which make healthy for you. ✹【LIFETIME REPLACEMENT WARRANTY】This nature fresh is reusable for 2 years! After two years you can trade your old nature fresh for the new one for free, you get a lifetime replacement warranty. If you have any questions about this product by SOHA Fresh Air, contact us by completing and submitting the form below. If you are looking for a specif part number, please include it with your message.